No wonder red and green are clipping. I think it may be the last straw for me, at least until this issue has been addressed. Last edited by squig; 10-24-2018 at 05:57 PM. Greens are clipping (when you wouldn't expect them to with just about every camera) too. 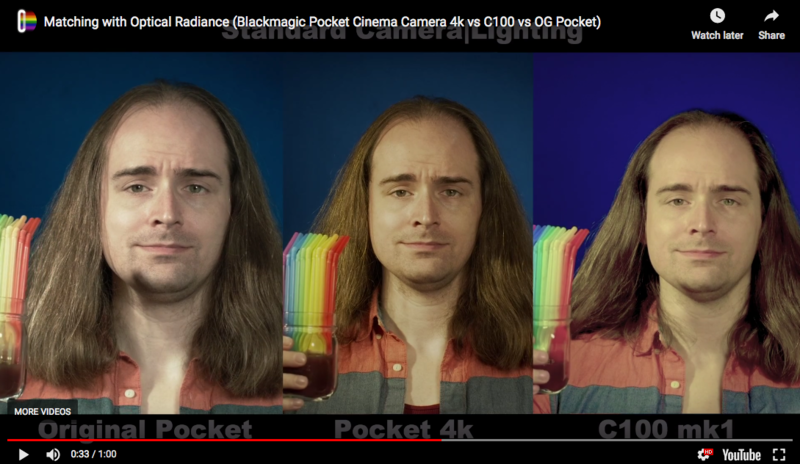 Was able to address it a bit in Resolve using a CST node and I wonder if I could do the same here in having the RAW dng frames, but still: Blackmagic needs to solve it. Yeah what the heck is going on here. Were these shot with an IR filter, just to be sure or without? As I shoot a lot of night stuff with these kind of neon signs. Yikes. Hope we can get some more tests on this and a solution. This is worth me canceling my preorder over. I was hoping to get this cam in time specifically for a grungy bar shoot with lots of neon signs and red lighting. It is not an overexposure issue. Yellows, blues, greens are perfectly handled when overexposed : desaturated with a creamy hallo around. The reds are oversaturated with harsh boundaries, like it was digitally painted. Just had a look at the DNGs. Maybe I'm just seeing things, but to me, it looks like the red clipping area is a extrem narrow band. Where that happens, red is totally blown, while there is zero information (like in totally blackout) in the blue and green channels at the same spot. So the debayering has to make up the image there, just from the blown red image information (that means also only a quarter of resolution) - no wonder im becomes a mono-colored blob. As I said earlier, I think it has to do with those super aggressive monochromatic LEDs. I remember similar effects, when the first cheap LED spots for stages and clubs became popular. I shot a commercial in a club, and even the Alexa wasn't able to handle that. We ended up replacing all lights in that club with our own old school disco lights. Last edited by Frank Glencairn; 10-25-2018 at 12:59 PM. The v4 debayering is wrong with how it's currently filling in blown highlights. V4 seems to add a bunch of saturation into the clipping area for no reason, making it look very harsh. The fact that I can simply set my clip from v1 and not have an issue then to v4 and have an extremely red oversaturated highlight tells me that the in camera and resolve v4 isn't functioning well and I wouldn't use it for anything paid. I really dig the way so many dudes from Australia look like they played for AC/DC at one time or another. How to know whether or not your highlights are clipping?